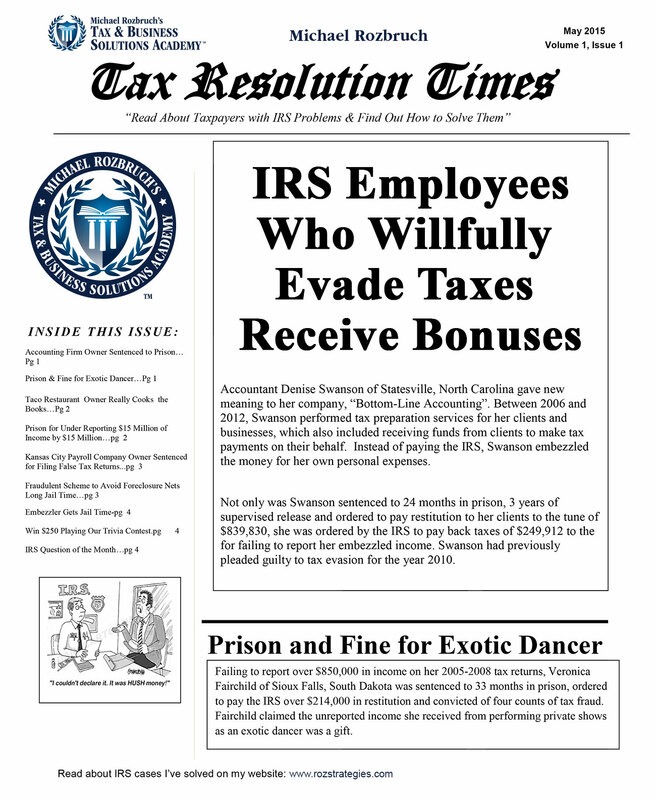 The Tax Resolution Times – A Done-For-You Newsletter! No problem! Here’s a solution! Every month, you can get your very own 4-page done-for-you Tax Resolution Times Newsletter which you can personalize and mail to all your leads, clients AND referral sources! This newsletter is a complimentary benefit to Insider’s Circle Coaching Members or can be purchased by non-members for only $149/month! A monthly newsletter is a great marketing tool to help you get more clients, as well as keep you in the minds of prospects who need your services but have yet to commit. The newsletter will contain: "IRS horror" stories, a trivia contest and an IRS question and answer which will be updated every month. In addition, the sections "Thank You! ", "Client of the Month" and "Thank You for the Kind Words" are areas for you to add your own information. The 4-page Tax Resolution Times newsletter will come to you as a "Word" document; and the areas in red are where you are to insert your information (be sure to change to black font). Once completed, save as a PDF and print yourself or take it to a printer and have them copy it on 11" x 17" paper with a fold and have them mail them for you. The Newsletter is only $149 per/month to non-members, and is FREE Insider’s Circle Coaching Members as part of the monthly membership fee!